HGA completed the office design for automotive services and insurance company giant AAA located in Walnut Creek. HGA, a multidisciplinary design firm, recently completed the interior design for the American Automobile Association’s (AAA) Northern California Nevada Utah (NCNU) headquarters. Now accommodating 380 employees with the incorporation of the relocated Emeryville office, the Walnut Creek location serves as the headquarters for AAA’s Northern California, Nevada and Utah regions. The 50,000-square-foot building redesign includes the addition of custom Knoll workstations to encourage collaboration, a conference center, café area with meeting areas and a high-impact entryway. One of AAA’s goals in the redesign was to construct a more efficient layout to house all of their employees and to create a freshened identity for their headquarters. 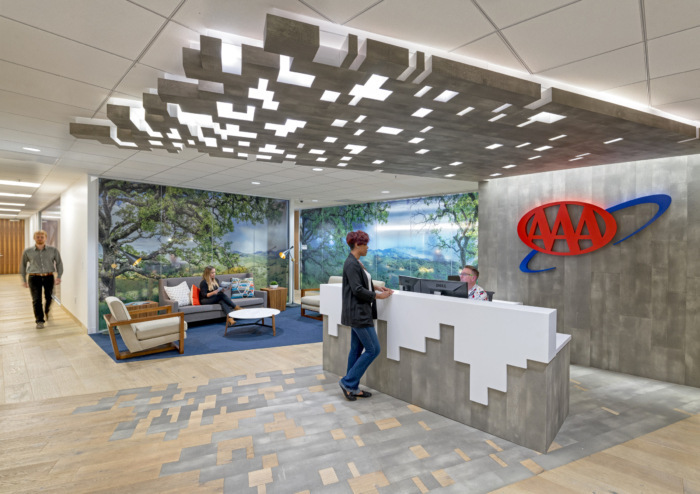 AAA’s wanted the headquarters to attract a younger clientele and workforce, while also retaining the employees they currently have. HGA designed both open and enclosed meeting spaces in a variety of sizes and heights to fit the office’s varied meeting styles. Because many of the meetings that occur in the office involve four people or less, HGA was able to save AAA substantial square footage and allot significantly more space for meetings by reducing the size of typical conference rooms which previously seated eight to ten employees. In addition to meeting AAA’s needs for a more efficient layout, HGA also integrated the AAA brand in the design by incorporating the theme of the “American road trip.” The new design contains specific elements that emulate the sense of camaraderie, excitement, and exploration when embarking on an adventure. For example, the boardroom features a wood treatment that resembles tire tracks and a table with vintage hubcaps; headlight light fixtures can be found in the conference room; meeting nooks are inspired by 1970s rest areas. The three “A’s” in “AAA” can be found in the design of three break rooms that incorporate the A-frame highway rest-stop design and across the hall a wall is decorated with vintage license plates from every state. Office artwork also supports the theme, with commissioned photography made into window film featuring the unique environments of the Northern California, Nevada and Utah regions. To create the sensation of peering through a car window, the window film in the office is activated by natural light throughout the space and by employees as they collaborate within the rooms or pass by. HGA engaged the entire AAA staff throughout the design process. Every employee in AAA’s NCNU office was able to vote on the palette for the new space as well as the selection of the new workstation standard that was used. The color palette selected was fresh, bright colors that match the yellow AAA trucks.